For almost a year now, I’ve had a finished article about how to be a ninja on flights and use your mobile device (in Airplane Mode) during the entire flight. However, all of the controversy over my article: Take Alcohol to Drink on Your Flight, gave me pause about posting it. It was helping people break the rules, no matter how pointless the rules were. Luckily, it’s now totally irrelevant. I’ll reminisce for a moment. Two years ago I sat next to an AA pilot in First Class. I didn’t know he was a pilot when he sat down, so I went about my normal routine of putting my phone in airplane mode, plugging my headphones into it, and stashing it under my left thigh. He noticed what I was doing and tapped my shoulder. I pulled my earbuds out and he then told me that he was a pilot for AA. My initial though was, “Busted!” However, instead of reprimanding me, he gave me some advice. He said that devices in airplane mode create zero issues. However, iPhones are the worst offenders when they aren’t in airplane mode. They give pilots horrible feedback in some cases. He then encouraged me to keep doing what I was doing, as long as it’s in airplane mode. By the end of the flight we had discussed his visit to the Boeing 787 prototype, the design of its cockpit and the Allied Pilots Association (union). We were pretty much best friends. It took AA a week to announce their adoption of the rule change, but it’s exciting to hear that they are completely removing the limitations. Just remember to use Airplane Mode. The pilots appreciate it. 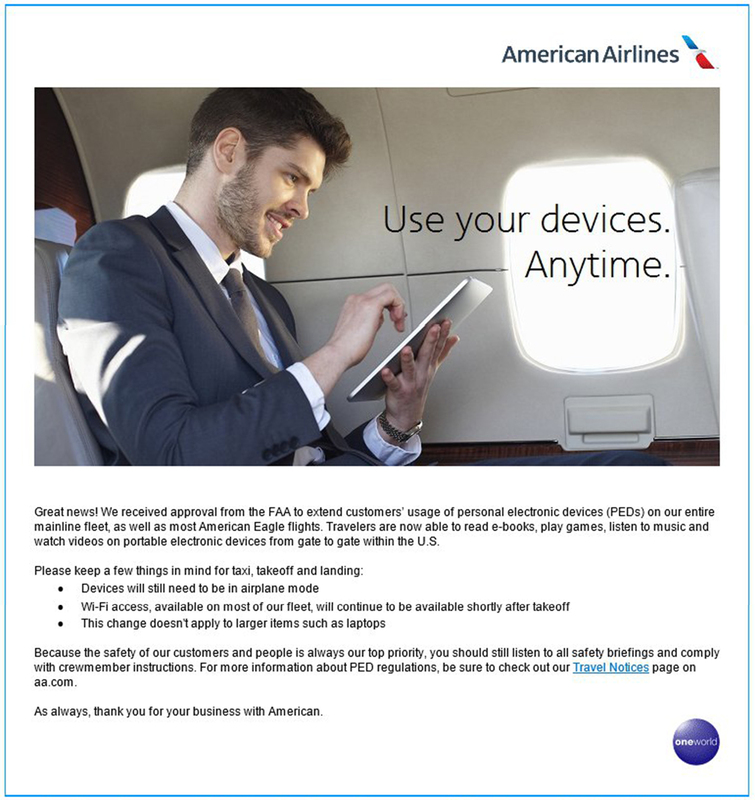 This entry was posted in American Airlines, Guides, Uncategorized and tagged aa, Devices, FAA, games, iPhone, music, phone, policy, rule, rules. Bookmark the permalink. The reason we need your headphones out n electronics off is so you’ll pay attention to tge safety demos and your surroundings ! Takeoff and landing are the most crucial times of a flight. We need passengers to be aware like we are. Now people will be so busy with their ekectronics who knows what will happen. Thanx to the FAA ! I’m pretty sure that passengers will realize the plane is going down, even if they are wearing headphones. Frequent flyers hear those safety messages 40+ times a year, so I think you’re being a bit over dramatic. Although this is true. (I’ve done it myself a few times.) do not take the ones made if glass unless you carry the bottle out with you. I was scolded/ informed by my attendant that she had to dig them out of the trash. Whoops! This was meant for the booze on flights! So far the FAA is the only one to do this so if you’re flying on a foreign airline/in another country (I just flew Singapore Airlines from Singapore to Germany to JFK) they still make you turn devices off.